With a growing demand for professionals in the language support services, teaching translation and interpretation is quickly becoming an educational imperative. By bringing together representatives of the industry and the academe, the conference aims to bridge the gap between the way translation is taught and the way it is practiced outside academic institutions. The conference addressed the need for new and innovative approaches to teach aspects of translation and interpretation at all levels of the undergraduate and graduate curriculum. While addressing various perspective and methodologies, the conference seeks to elevate the profile of translation pedagogy as an independent academic discipline and explore its impact on other professional fields. The event is free and open to the public. NB: if you are not a Hunter student or employee, you must RSVP below and bring a photo ID to get a pass at the main guest entrance (Hunter West). "Crossing Cultural Borders in a Digital World"
"Teaching Culture and Intercultural Communication to Future Translators and Interpreters"
The workshop uses actual student assignments to discuss effective feedback, codification of errors, and other aspects of teaching Russian-language translation courses. "Enhancing Localization Graduate Employability Through Skill-Driven Curricula"
"Using and Integrating Large Institutional Websites in Translation Courses"
"Starting from Scratch: Developing an Introduction to Translation and Interpreting Courses"
​"Pre- and Post-Translation Tasks in Translation Pedagogy"
“Spanish Translation for Community Based Organizations"
"Translation as Cultural Mediation: Teaching Russian Poetry to Russian Heritage Students"
"Teaching Translation as an Advanced Language Course"
"Bridging the Divide: Anton Chekhov’s “Sleepy” and the Challenges and Rewards of Literary Transposition"
"Teaching Translation from All Languages: Evaluation, Integration, and Relevant Readings (for the Professor Who Knows Only Some of Them)"
Panel IV: Reading like a Translator: Engaging with Literature as Translation"
​"Reading Practices for Graduate Translation Pedagogy"
Aron Aji is the Director of MFA in Literary Translation at University of Iowa. A native of Turkey, he has translated works by Bilge Karasu, Murathan Mungan, Elif Shafak, LatifeTekin, and other Turkish writers, including three book-length works by Karasu: Death in Troy; The Garden of Departed Cats, (2004 National Translation Award); and A Long Day’s Evening, (NEA Literature Fellowship, and short-listed for the 2013 PEN Translation Prize). He also edited, Milan Kundera and the Art of Fiction. Aji leads the Translation Workshop, and teaches courses on retranslation, poetry and translation; theory, and contemporary Turkish literature. He is also the president of The American Literary Translators Association. Brian James Baer is Professor of Russian and Translation Studies at Kent State University. He is the author of the monographs Other Russias (2009) and Translation and the Making of Modern Russian Literature (2016), as well as the editor of several collected volumes, including Beyond the Ivory Tower: Re-thinking Translation Pedagogy with Geoffrey Koby (2003), Contexts, Subtexts, Pretexts: Literary Translation in Eastern Europe and Russia (2011), Researching Translation and Interpreting, with Claudia Angelelli (2015), Translation in Russian Contexts, with Susanna Witt (2018), and Queering Translation, Translating the Queer, with Klaus Kaindl (2018). He is founding editor of the journal Translation and Interpreting Studies and co-editor of the Bloomsbury book series Literatures, Cultures, Translation. He is also the translator of Juri Lotman's final monograph, The Unpredictable Workings of Culture (2013), and a forthcoming collection of essays by Lotman on cultural memory. He is the current president of the American Translation and Interpreting Studies Association. Esther Allen's most recent translation, Zama by Antonio Di Benedetto (NYRB), won the American Literary Translators Association's National Translation Award, and was listed by Publisher's Weekly among the 20 best works of fiction published in 2016. In 2018, she was awarded a Guggenheim to support the translation of two more novels by Di Benedetto. She is a professor in the Ph.D. Programs in French and in Latin American, Iberian and Latino Cultures at City University of New York Graduate Center, and at Baruch College, CUNY. Recent articles and translations are at .estherallen.com. Erik Angelone is Associate Professor of Translation Studies at Kent State University and coordinator of Kent State University’s new online M.A. in Translation program. He received his Ph.D. in Translation Studies from the University of Heidelberg and his M.A. in Intercultural Communication from the University of Maryland Baltimore County. His research interests include process-oriented translator training, translation pedagogy, intercultural communication, and online teaching and learning. He co-edited the volume Translation and Cognition (with Gregory Shreve) and is currently co-editing the volume Bloomsbury Companion to Language Industry Studies (with Maureen Ehrensberger-Dow and Gary Massey). He has over 15 years of experience in training translators at Kent State University, the Zurich University of Applied Sciences, and the University of Heidelberg. Diana Biagioli has been working in the nonprofit world for over thirty years in the fields of immigration, environmental protection and, presently, in special education. Diana was raised in Mallorca, Spain and speaks Spanish and French fluently. She has also studied Italian, German and Catalan. As an undergraduate, Diana studied French and Political Science at the University of Massachusetts. She earned a master’s degree in Latin American Studies from Tulane University and a Certificate in Translation (Spanish to English) from NYU. Presently, Diana works as a consultant for INCLUDEnyc where she helps families (particularly Spanish speakers) navigate the Special Education process. She also translates documents such as newly created presentations and tip sheets and has served as an Interpreter when needed. Loubna Bilali is an Assistant Professor of Translation Studies at Kent State University. She is originally from Morocco. Loubna holds a Ph.D. in Translation with a focus on Localization from Kent State University, a Master’s degree in Translation (French-English) also from KSU, and a Master’s Degree in Cross-Cultural Communication and Translation from Chouaib Doukkali University in Morocco, where she also completed her undergraduate studies in English Linguistics. As part of her teaching responsibilities, Loubna is in charge of translation technology courses at the Institute for Applied Linguistics at KSU. She is also an English-Arabic grader for the American Translators Association (ATA). Her research interests are varied, including localization training, terminology management, corpus-based research, and translation pedagogy. Garrett Bradford is a freelance conference and court interpreter based in Washington DC. He provides training for the Maryland Court Interpreter Program. He holds a Master's degree in Interpreting from the University of Maryland's Graduate Studies in Interpreting and Translation program and trained in court interpreting at the University of Arizona. In addition, he translates from Spanish to English for multilateral, federal, and non-governmental entities. 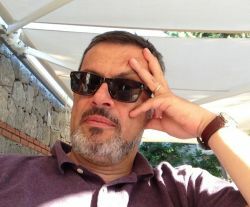 In spring 2019, he became an adjunct lecturer at the University of Maryland teaching an introductory interpreting and translation undergraduate course. Christopher Czubay is a senior at Hunter College double-majoring in English Literature and Creative Writing and Russian Language and Culture. María Cornelio is Coordinator of the Spanish/English Major Concentration for the B.A. in Translation & Interpretation at Hunter College of the City University of New York. For nearly a decade, she was Director of the Hispanic Resource Center at Columbia University Medical Center. During that time, she was also the Spanish-language consultant to the Institutional Review Board of the New York State Psychiatric Institute. Ms. Cornelio is a founding member of Kaiser Permanente’s National Coalition for Quality Translations in Health Care. She was a member of the NYC Health and Hospitals Corporation CLAS Office task-force that developed the linguistic-competency screening test for the CUNY Medical Interpreter Training Program. Ms. Cornelio has published extensively on translation topics and has conducted continuing-education seminars for the State of Connecticut Judicial Branch Interpreter & Translator Services and for professional organizations such as the United Federation of Teachers, the American Translators Association, and the New York Circle of Translators. She is included in Who’s Who in America (64th Edition, 2010) and the newspaper El Diario chose her for inclusion among its “Mujeres Destacadas/Outstanding Women 2007” for her contributions in the area of English-Spanish communications. Mekki Elbadri, Senior Reviser of Arabic language translation at the United Nations, New York. Holds a BA in French, a Graduate Diploma in Translation, MA in English as a Second Language, and PhD in linguistics. He has experience in translation, interpreting and language teaching (Arabic, French, English). His research interests include translator training, coaching language professionals, CAT tools and language issues in international organizations. Karen Emmerich is the author of Literary Translation and the Making of Originals (Bloomsbury, 2017), and the translator of a dozen works of Modern Greek literature, most recently Christos Ikonomou's Good Will Come From the Sea (Archipelago, 2019). She has received awards and grants from PEN, the NEA, and the Modern Greek Studies, and is an Associate Professor at Princeton University. Annalisa Nash Fernandez is a specialist in world cultures, focusing on cultural elements in technology and business. An experienced corporate strategic planning director, she bridges her dual background as a sociolinguist to navigate cross-cultural communication. Annalisa held various roles at Philip Morris International and Kraft Foods, based in São Paulo, and investment banks in New York and Santiago. In her consulting career she is a linguist for Transperfect, an intercultural strategist for multinationals, and a pro bono interpreter and advocate. Annalisa holds an MA in translation from the University of Wisconsin, and a BS in international finance from Georgetown University. Annie O. Fisher is a Russian literary translator. With Margarita Meklina, Fisher co-edited the folio Life Stories, Death Sentences: Contemporary Russian-Language LGBTQ+ Writing, forthcoming with InTranslation during Pride Month 2019. As Senior Lecturer in the UW-Milwaukee Translation and Interpreting Studies program, Fisher teaches remotely from her home in Indiana. Sibelan Forrester is Susan W. Lipincott Professor of Modern and Classical Languages and Russian at Swarthmore College, where she teaches Russian language and literature and a regular translation workshop. She has published translations of fiction, poetry, scholarly prose and songs from Croatian, Russian and Serbian. Dr. María José García Vizcaíno is Associate Professor of Spanish and Director of the Graduate Certificate Program in Translation and Interpreting in Spanish at Montclair State University (MSU). Among her most recent publications are “Sentimiento atlético: Persuasion and Emotion at Play” in García-Gómez & Díez-Prados (eds). Exploring evaluative, emotive and persuasive strategies in discourse, “Dime cómo vendes y te diré quién eres”: actividades de imagen e identidad en la publicidad de Yoigo (or “Birds of a feather sell together: face work and identity in Yoigo advertising”) in Sociocultural Pragmatics: An International Journal of Spanish Linguistics, and “When ‘Holy cow!’ becomes a team loyalty marker: translating fútbol across cultures” in Perspectives: Studies in Translation Theory and Practice. Dr. Garcia Vizcaino has presented her work at numerous conferences, panels, and symposia around the world and alternates her teaching of Translation and her research with her work as a professional translator. Jason Grunebaum is a writer and translator whose books include Uday Prakash’s The Girl with the Golden Parasol, The Walls of Delhi, and, with Ulrike Stark, Manzoor Ahtesham’s The Tale of the Missing Man. His work has been shortlisted for the DSC Prize in South Asian Literature, longlisted for the National Translation Award, and he has been awarded the Global Humanities Translation Prize, a National Endowment for the Arts Fellowship, and a PEN/Heim Translation Grant. He teaches both Hindi language and literary translation the University of Chicago. Françoise Herrmann is a freelance translator and interpreter, residing on the West Coast, specializing in medical and patents translation. She currently teaches French, and carries out research, at SJSU. She has taught patents and medical translation at MIIS, ESIT (France) and NYU, and writes three blogs to keep in touch with her students: Patents on the soles of your shoes (http://patentsonthesolesofyourshoes.blogspot.com), Billets techniques TRADMED (fichestechniquestradmed.blogspot.com) and Billets technique TRADLEX (billetstradlexbrevets.blogspot.com/). She is also in the process of publishing the first 6 years of Patents on the soles of your shoes. Adrian Izquierdo is an Assistant Professor in the English Department of Baruch College. His research interests revolve around the translation of texts and ideas across cultural divides in Renaissance literature, and in today’s globalized world. Professor Izquierdo has published several articles on Renaissance literature and translation both in Europe and in the U.S. His book, Pierre Matthieu en España. Biografía, política y traducción en el Siglo de Oro [Pierre Matthieu in Spain: Biography, Politics and Translation in the Spanish Golden Age] (Iberoamericana-Vervuert, 2019) reconstructs the intricate web of connections established among early modern humanists who used ancient biography and translation to probe into the political landscape of their times in England, Italy, France, Spain, and Portugal. It also explores the role of translation and translators in the development of the genre of political biography in 17th-centuy France and Spain. At Baruch, he teaches courses in the Great Works program and on cultural translation, translation studies, and translation history. Anne Janusch’s translations include works by Jürgen Goldstein, Wolf Haas, Anja Kampmann, Walter Kappacher, Heinrich von Kleist, and Uwe Tellkamp. She has an MFA from the University of Iowa and has been the recipient of fellowships from the National Endowment for the Arts and the Robert Bosch Foundation. Janusch teaches literary translation workshops in the University of Chicago’s creative writing program, where she is fiction editor for Chicago Review. Laurence Jay-Rayon Ibrahim Aibo is a translation studies scholar and translation curriculum designer who runs her consulting firm, Into French Translations. She currently teaches Translation and Interpreting Ethics and Standards at the University of Massachusetts Amherst. She has been a T&I practitioner and trainer for many years and is certified by the Certification Commission for Healthcare Interpreters as a core-certified health- care interpreter. A French native, she has held positions in academia, as well as the private and public sectors in France, Germany, Djibouti, Québec, and the United States. She holds an M.A. in translation and a Ph.D. in Translation Studies from Université de Montréal and is a reviewer for international translation studies journals. She is the Director of the Colony In Crisis in Haitian Creole Translation Project funded by the New Jersey Council for the Humanities Association. Reyes Lázaro is associate professor in Spanish and Portuguese Department (Iberian literatures and cultures); World Literatures Program member, and director of the Translation Studies Concentration at Smith College in Massachusetts. A late-comer to Translation Studies, he believes that this is one of the most exciting and promising fields presently existing in the Humanities. Dr. Lázaro is currently translating (English-Spanish) a children's story from the perspective of Eco-translation; and attempting to co-translate (Spanish-English) a 17th-century satire written by a Sephardic exile in Amsterdam, that, under the appearance of praising Christian chocolate over Muslim coffee, condemns the Spanish Inquisition. Aída Martínez-Gómez holds a PhD in Translation and Interpreting from the University of Alicante (Spain). Her research focuses on interpreting and language access in prison settings, non-professional interpreters and young language brokers, translation/interpreting pedagogy for heritage learners, and interpreting quality. Her work has been published in international peer reviewed journals such as Interpreting and Perspectives: Studies in Translatology, as well as in collective volumes such as The Routledge Handbook of Interpreting (2015). She is currently Assistant Professor of Translation and Interpreting at John Jay College of Criminal Justice (City University of New York), where she directs the programs in legal translation and interpretation. She is also the Vice-President of the Society for the Study of Translation and Interpreting (SSTI), the educational and research foundation of the National Association for Judiciary Interpreters and Translators (NAJIT), and a Member-at-large of the Executive Board of the American Translation and Interpret- ing Studies Association (ATISA). Cristiano Mazzei holds a B.A. in Translation and Interpreting from Unibero University in São Paulo, Brazil, and a M.A. in Translation Studies from UMass Amherst. Cristiano is currently the Director of Translator and Interpreter Training at the University of Massachusetts Amherst. His main academic research interests include representations of queer subcultures, identity formation through translation and interpreting, and the intersections of translation and interpreting studies, queer and postcolonial theories, and performance. He is a CoreCHIA certified healthcare interpreter, certified court Interpreter by the National Center for State Courts, certified US State Department translator and interpreter, and certified translator and interpreter in the state of São Paulo, Brazil. Ainsley Morse is a scholar, teacher and translator of Russian and former Yugoslav literatures, currently teaching at Pomona College. Book-length publications include poems by Igor Kholin, Vsevolod Nekrasov and Andrei Senkov; forthcoming in 2019 are the farcical 1931 Soviet pastoral Beyond Tula, by Andrey Egunov, and a collection of theoretical essays by the Formalist critic Yuri Tynianov. Current projects include work by contemporary poets Lida Yusupova and Dina Gatina, and the 1920s novels of Konstantin Vaginov. Margarit Ordukhanyan’s is an Armenian-born scholar and translator. She writes about translation theory and pedagogy, literary bilingualism and literature of exile. Professor Ordukhanyan has authored numerous articles and book chapters about the intersections between these areas. She also translates fiction and poetry from Russian and Armenian into English. Her current translation projects include Letters from Sonya Carroll from the Armenian of Vache Sarkissian, a fictionalized autobiography of an Armenian dissident writer’s experiences in the GULAG system, as well as translations of poems by members of the Russian cultural underground of the 1970s. She teaches at Hunter College, CUNY, where she directs the undergraduate major in translation and teaches Russian literature in the comparative context, practical and theoretical aspects of translation, and others. Julie Van Peteghem is Assistant Professor of Italian in the Department of Romance Languages at Hunter College, where she teaches courses on medieval Italian literature and culture, Italian language and translation. She is Associate Editor of Digital Dante and the Editor of the Intertextual Dante project on the site. She earned her PhD in Italian and Comparative Literature from Columbia University; the Intertextual Dante project grew out of her dissertation research on Ovidian intertextuality in Dante’s Divine Comedy. She is currently completing her first book, Italian Readers of Ovid from the Origins to Petrarch, a historicized study of Ovid’s influence on Italian poetry of the Due and Trecento. Her work has appeared in Humanist Studies & the Digital Age, Italian Studies, and she has an essay forthcoming in Studi Danteschi. Nadya Peterson is an associate professor of Russian at Hunter College. She is a specialist on contemporary Russian prose, women’s literature and Chekhov. She is a published translator and editor. Her scholarly interests also include Russian culture, history, and Russian education. Peterson is on the faculty of the Doctoral Program in Comparative Literature at the CUNY Graduate Center and has served as the Head of the Russian and Slavic Studies Program at Hunter since 2010. Ian Probstein, associate professor of English at Touro College, is a bilingual Russian-American poet, scholar, and translator of poetry. He has published eleven books of poetry in Russian, one in English, translated more than a dozen poetry volumes; and has compiled and edited more than thirty books and anthologies of poetry in translation. His essays, poems in English and translations of poetry into English have been published in Atlanta Review, The International Literary Quarterly, Brooklyn Rail: In Translation, Jacket-2, Four Centuries of Russian Poetry in Translation, Ugly Duckling Presse, and International Poetry Review, Salonika, Spring, a journal of E.E. Cummings Society, Calliope, CrazyHorse, Rhino, Sibilla, The Epoch Times, The McNeese Review, Metamorphosis, and some others as well as in An Anthology of Jewish-Russian Literature, 1801-2001: Two Centuries of a Dual Identity, 2 vols. Maxim D. Shrayer, editor. Armonk, NY: M E Sharpe, 2007, vol.2., and in the book Vita Nuova (Philadelphia: R.E. M. Press, 1992). His translations of Osip Mandelstam into English were chosen as a runner–up to The Gabo Prize for Literature in Translation & Multi-Lingual Texts (2016) while his translations of Ezra Pound’s Cantos were shortlisted for the Russian Guild of Translators Master Award. He compiled, edited, commented Complete Poems and Selected Cantos of Ezra Pound in Russian Translation. A Bilingual Edition (St. Petersburg: Vladimir Dahl, 2003), of which is one of the major translators, and participated in the definitive edition of The Collected Poems of Dylan Thomas in Russian (Moscow: Rudomino, 2015). His most recent book in English is The River of Time: Time-Space, Language and Recently he published The River of Time: Time-Space, Language and History in Avant-Garde, Modernist, and Contemporary Poetry. Boston: Academic Studies Press, 2017, and in Russian, Complete annotated edition of T. S. Eliot’s Poetry and Plays (1120 pp. St. Petersburg: Azbuka–antiqua, 2018 (4000 copies; long-listed for the Russian Guild of Translators Master Award, 2019). Laura Ramírez is a lecturer at Rutgers, where she teaches a number of courses on Translation Englihs-Spanish and Spanish Composition. She has more than 15 years of experience in the Academia and the translation industry as a translator and project manager. Her research interests include computer-aided translation, terminology, global digital marketing, human-machine interaction and new types of digital genres for translation, areas in which she has authored numerous articles and book chapters. Dr. Ramírez is currently in charge of the translation program in the Spanish and Portuguese Department at Rutgers, and her duties include the coordination of an undergraduate and graduate Certificate, an MA, internship courses and a final practicum. She holds a degree on Translation and Interpretation from the University Jaume I in Castellón, a degree on Library and Information Science from the Universitat Politècnica de Valencia, and an MA on Computational Linguistics from the Ludwig-Maximlians-Universität in Munich. She received her PhD on Controlled Languages and Machine Translation from the University of Valencia in 2012. She is currently pursuing an MA in Medical Translation. Monique Roske, owner/President of M2 Language Consultants LLC, serves as Foreign Language Consultant to a number of US Government agencies and private clients. Ms. Roske possesses extensive translation and interpreting experience and taught translation and interpreting at Georgetown University for 14 years. Ms. Roske works hand-in-hand with U.S. Government agencies at the Interagency Language Roundtable (ILR) and at ASTM, where she serves as Vice-Chair of ASTM F43 (Language Services) and Chair of ASTM F43.01 (Interpreting Subcommittee) and published the latest ASTM U.S. Standard Practice for Interpreting in 2015. She also acts as Assistant Administrator of the American Translators Association’s Government Division. Julia Trubikhina received her PhD in Comparative Literature from New York University. She teaches in the Division of Russian and Slavic Studies at Hunter College, CUNY. Her book The Translator’s Doubts: Vladimir Nabokov and the Ambiguity of Translation (Academic Studies Press, 2015) received the Samuel Schuman Prize in Nabokov Studies in 2016. In addition to scholarly articles and reviews in academic journals, Julia Trubikhina (as Julia Trubikhina-Kunina) also published translations and contributed original poetry to Russian, European, and American anthologies and literary journals. The first English-language volume of the contemporary META poet Vladimir Aristov, which Trubikhina edited and co-translated with Betsy Hulick came out in 2017 (Ugly Duckling Presse). Her current projects include a book on Nabokov and translation as well as on a literary translation project: poetry and prose by poet and writer Elena Shvarts (together with Betsy Hulick). Her translation of Efim Etkind’s memoir The Barcelona Prose is forthcoming in 2020. Andrew Tucker is a PhD Fellow in Translation Studies at Kent State University as well as a Curriculum Designer at Universidad Nacional Autónoma de México (UNAM). He has taught translation at both American and Mexican universities and has extensive legal and commercial translation experience. Andrew’s research interests include online teaching and learning, translation pedagogy, legal translation, and corpora in translation. He obtained a Master of Hispanic Studies and BA in Spanish at Auburn University as well as a Certificate in Spanish-to-English Translation at New York University. Iván Villanueva-Jordán is a full-time lecturer and the coordinator of the Professional Translation and Interpretation Program at Universidad Peruana de Ciencias Aplicadas. He has been a Visiting Professor at the Middlebury Institute of International Studies at Monterey and at Universitat Jaume I (Castellón de la Plana, Spain). He has done research in translated children’s literature, transgender identities, and is currently finishing his doctoral dissertation on the representation and translation of gay identities in global telefiction. Caitilin Walsh is an ATA-Certified French-English translator who delights in producing publication-quality translations for the computer industry and food lovers alike. A graduate of Willamette University (OR) and the Université de Strasbourg (France), and a past President of the American Translators Association, she currently chairs the ATA Education & Pedagogy Committee. She brings her strong opinions on professionalism as an instructor of Ethics and Business Practices at the Translation and Interpreting Institute at Bellevue College, and to the T&I Advisory Committee for the Puget Sound Skills Center (both in Washington State). When not at her computer, she can be found pursuing creative endeavors from orchestra to the kitchen. She can be emailed at cwalsh@nwlink.com , and you can follow her on Twitter @caitilinwalsh. Jennifer Zoble is an assistant clinical professor in the Liberal Studies program at NYU, where she teaches writing and translation. She translates Bosnian/Croatian/Serbian- and Spanish-language literature. Her translation of the short story collection Mars by Asja Bakić was just published by Feminist Press. She received a 2018 NYSCA grant, having been nominated by PEN, in support of her translation of the short story collection Call Me Esteban by Lejla Kalamujić. She’s the co-editor of InTranslation at The Brooklyn Rail and co-producer of the international audio drama podcast Play for Voices. Hunter College is located on Manhattan's Upper East Side, on the intersection of 68th Street and Lexington Avenue and is easily reachable by subway, with the 6 (Hunter College stop) and F, N, Q (Lexington 63rd St. stop). Upon arrival at Hunter, you must check in with a valid photo ID at the security desk located on the first floor of Hunter West Building (south-west corner of 68th Street and Lexington Avenue). If you are traveling from out of state, some nearby options for accommodations include Bentley Hotel, Renaissance Hotel New York 57, and The Franklin.